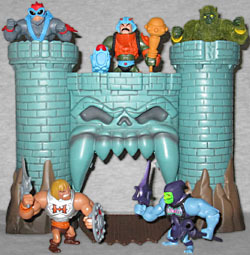 So, as we've told you again and again (and again and again and again and again), buying all six MotU Minis sets would allow you to build a Castle Grayskull. And here it is! 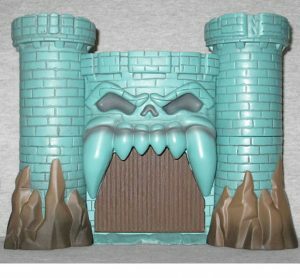 Mattel's released a full-sized Castle Grayskull, but even when it was marked down to 50% off, I still couldn't imagine getting it. If you want a review of that, ask Shocka. I got these Minis because it finally afforded me the opportunity to own a Castle Grayskull, even if it was in cutesy super-deformed style. 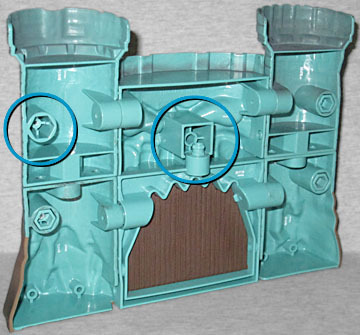 The castle is made from six sections that plug together. At least in theory. Mattel being Mattel, a third of the pieces I got had been shipped without their connectors. As you can see, the only thing holding the upper face to the lower face is the fact that they both plug into the towers. And in fact, one of the tower connectors was missing, too; fortunately, they're all the same size, so I was unable to unscrew one of the superfluous ports, move it over and rescrew it somewhere it would actually be useful. 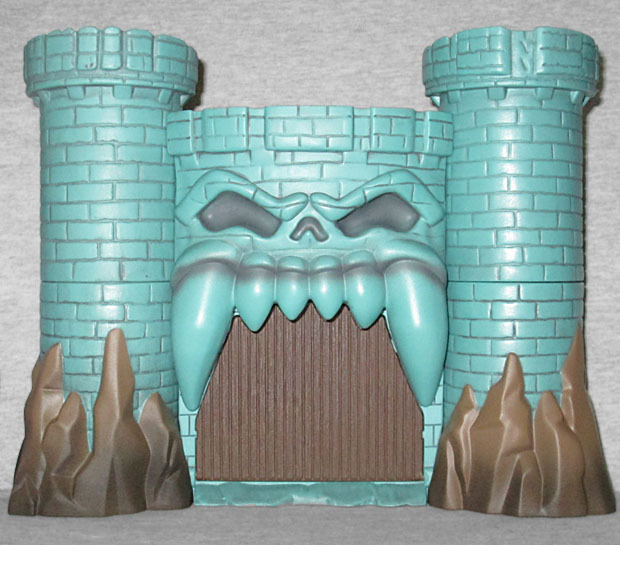 Assembled, Grayskull stands nearly 6¼" tall, and is 8⅛" wide. Since it's just a facade, you'll won't even need 1½" of depth to display it. The bricks it's made from are all merely sculpted, of course, but they look realistic enough to fit with the style of this line. The stone is a bluish green, with a darker shade between the bricks, as well as airbrushed in the eyes, nose, and at the top of the teeth. The rocks at the base of the two towers are brown, and also get airbrushed darker at the base. The weathering does a decent job of making this look like an ancient keep that's been standing in place for centuries, and the fact that it's flat makes it a great background for an average toy collector's display. There are three platforms at the top where figures can stand. There's also an unexpected play feature, in which the jawbridge opens. It's not a complex thing, but it adds a little spice and variety to the display. It's sculpted to look like planks of wood, and the end is cut to fit past the castle's teeth. 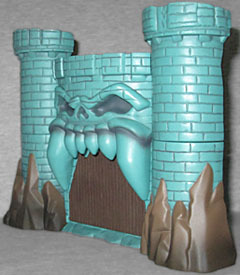 Castle Grayskull is definitely a case where the Build-A-Figure (or "Collect & Connect," Mattel's Battleborn to ToyBiz/Hasbro's Overwatch) helped sell the figures. In six straight reviews we've said the toys were kind of garbage for the price Mattel asked, and honestly they'd be garbage at 50% off, too - no way is a single MotU Mini worth $5. But throw a BAF in there, and suddenly it looks a lot better. Now I'm honestly a bit sad that Series 2, with a Build-A-Snake-Mountain, isn't going to happen. This entry was posted in blog exclusive review, Mattel and tagged MotU. Bookmark the permalink. Could have had a great, affordably-priced Imaginext line with vehicle packs and awesome playsets. Or even some fun Mega Bloks sets. But no, let's get a bunch of guys who skip leg day instead. Who wants to be dragged into a subscription when the figures aren't that great? Marvel Mashers Micro would be dead by now too if that's how Hasbro handled them.